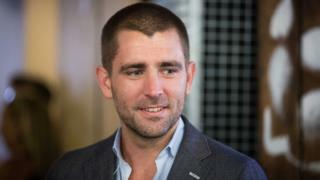 Image caption Chris Cox was one of Facebook's longest-serving executives and a confidante of Mr Zuckerberg. Facebook founder Mark Zuckerberg has announced the departure of the firm's chief product officer Chris Cox and head of WhatsApp Chris Daniels. The changes come shortly after Mr Zuckerberg outlined his plan to transform Facebook into a "privacy-focused platform." This week the social media giant and its platforms WhatsApp and Instagram also experienced the worst outage in the company's history. Facebook later blamed the blackout on a "server configuration change". He also held several senior roles, heading up human resources and helping to launch Facebook's business platform Workplace. He did not give a reason for leaving, but Mr Zuckerberg insisted that he had "been discussing... his desire to do something else" for several years. He will be replaced by Will Cathcart, who currently heads up Facebook's mobile app. Fidji Simo, who ran the app while Mr Cathcart was away on paternity leave, will take on his role. User numbers in the US - its second-largest market - have fallen by 15 million since 2017, however, according to market research firm Edison Research.